Copy paste are the SECOND most commonly used keyboard shortcuts across Office tools. But it never works exactly the way you want. I could not find any detailed and easy to understand explanation about various ways of copy pasting. Hence I am starting with this series. If you are in a hurry, just read the Summary at the bottom. Guess what is the MOST COMMON shortcut used? Yes. UNDO is the most common action performed by ONE BILLION people everyday! I am sure you also use UNDO everyday – without realizing one very disturbing and demeaning fact. Why do you need to use UNDO so often? If you did something by mistake and then used UNDO, it is fine. But usually, you use UNDO because you wanted something to happen and then something else happened. You don’t want it that way. Therefore you press UNDO. But what you originally wanted is still not done. You will now get that done in some other manual, round-about way. So think again… what is that UNDO telling you? So here is a simple way of improving your efficiency. Every time you are about to press Ctrl Z… STOP there. And think a little. What can I do differently so that I will get what I want. This way I will ELIMINATE the need for UNDO in that context next time onwards. Every UNDO is a learning opportunity! The most common reason why we need to UNDO is COPY PASTE gone wrong. Therefore, we will discuss copy paste in detail in this series of articles. We copy SOMETHING from SOMEWHERE and paste it SOMEWHERE ELSE. Copying is easy. Whatever is selected is copied and put in the clipboard. But what about Pasting at the destination? There could be many ways of pasting it. Depending upon the content and your needs, various formats may be used for pasting. Common formats are text only, picture, grid and so on. The problem is when you press CTRL V to paste, which format should Microsoft apply by default. Microsoft finds out the most commonly desired format by surveying users and that becomes the default. 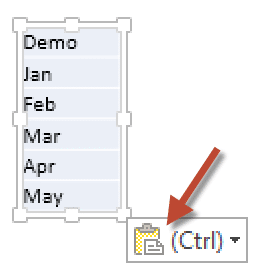 For example, if you copy any Excel data and Paste it into PowerPoint, the default format is a TABLE. Why so? Because Excel is anyway like a huge grid (table) and PowerPoint does not understand Excel format but it understands what a Table is. Therefore, that is the default. What if you don’t like the default paste format? No problem. Microsoft has already thought about it. That is why there is PASTE SPECIAL. It shows all the available formats for pasting – including the default. The wrong way… which incidentally the most common way! After the default paste, one small little icon appears automatically and hopes to attract your attention. It did attract attention but in the wrong way. Everyone hates it. Nobody knows why such icons appear in the first place. In fact it it difficult to get rid of them. They just linger around irritating you even more! 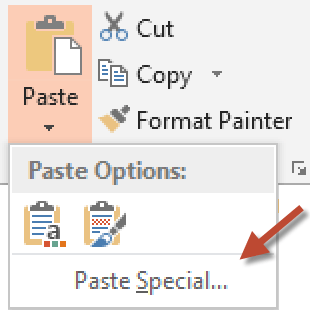 When you click on it (or press key) it shows you most of the options which you get in Paste Special. You can then choose the one you want. Unfortunately, most of us never noticed this great feature and therefore, never benefited from it. Microsoft still continued its effort to make our lives easier. 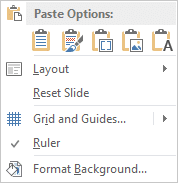 Since 2010 onwards, they modified the Right Click menu to add all the Paste Options in it – complete with the live preview. If you want to copy paste in the most efficient way… here is the right method. While choosing formats, notice the keyboard shortcuts and start using them for even more efficient and accurate copy paste. In the next article we will cover nuances of various pasting formats – Paste Sepcial – Deep Dive for Excel.